Here’s a bit of positive news: A judge has granted a stay of deportation to a restaurant worker detained by ICE, at a moment when all signs pointed to his imminent deportation. On June 1, Pablo Villavicencio was turned over to U.S. Immigration and Customs Enforcement by a military police officer after Villavicencio attempted to deliver pizza to Fort Hamilton in Brooklyn. Gregory Copeland, Villavicencio’s representation from the Legal Aid Society of New York, told the Timesthat the next focus is getting him out of detention. 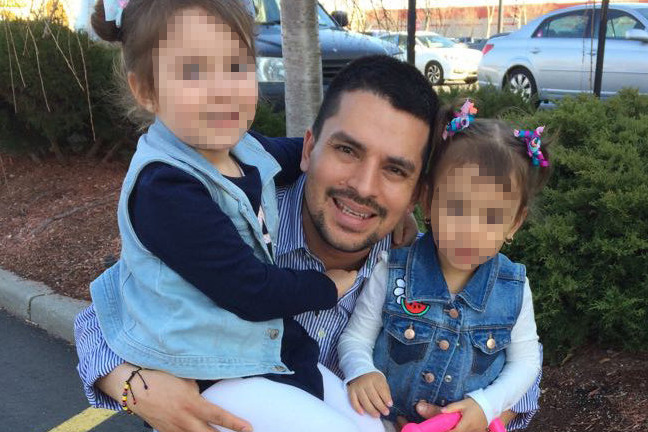 The father of two, who has no criminal record, is still at risk for deportation. Last week, in the hours after it was reported that Pablo Villavicencio had been arrested and moved to Hudson County Correctional Facility in New Jersey, accounts from Fort Hamilton police, along with information from Villavicencio’s family and a statement from ICE, revealed a complex case. Villavicencio entered the U.S. in 2008 without documentation, and as such was the subject of a voluntary removal order in 2010. He is married to a U.S. citizen and initiated a green-card application in February, his wife said. On the day of his detention, Villavicencio traveled from his job at a Queens pizzeria and presented his IDNYC card at the Fort Hamilton gate. Fort Hamilton military police claim that Villavicencio signed a mandatory waiver related to a background check, which Villavicencio denies. “I am 100 percent sure that I did not sign any document there,” he told the Post. Pablo Villavicencio has no criminal record, and New York is a sanctuary city. Over the weekend, Governor Cuomo and Mayor de Blasio commented that the detention was a “part of a pattern targeting New York residents” because of authorities’ limited cooperation with officials, and that Villavicencio is not a risk to public safety, respectively. While his case remains to be adjudicated, restaurants in the vicinity of Fort Hamilton are reportedly refusing to deliver to the base. “If they want food, let them come here [to pick it up],” one delivery worker told the Post, while a manager of Orders2me, a delivery service, said that the base had been removed from its delivery zone. (NEW YORK, NY) – The Legal Aid Society, members from Make The Road New York, and Council Member Carlos Menchaca rallied in support of an emergency stay motion filed this afternoon for Pablo Villavicencio. Villavicencio was recently detained by Immigration and Customs Enforcement (ICE) after delivering a pizza to Fort Hamilton Army base in Brooklyn, where a guard contacted ICE after running a background check on Villavicencio. The motion urges ICE to issue an immediate stay of removal on humanitarian grounds so that Villavicencio can continue to pursue a meritorious form of relief from removal - adjustment of status for permanent residency – to remain with his family. VIDEO: Sandra Chica, wife of Pablo Villavicencio, calls on rogue @ICEGov to immediately free her husband as she submits an application for a stay w/ @LegalAidNYC, @cmenchaca, and our members. "The current broken immigration system fails all of us. By preventing hard working immigrants from contributing fully to our economy, we both hamper our economic growth and waste tremendous resources on an enforcement system that all agree does not work. Mr. Villavicencio-Calderon deserves an opportunity to fully explore his legal options to remain in the country. He has made this country his home and built a life with a beautiful family,” said Council Member Carlos Menchaca and Chair of the City Councils Immigration Committee. Villavicencio is currently detained in New Jersey and could be deported back to his native Ecuador as early as Monday. If the motion is granted, Villavicencio would be released from detention and would be afforded the opportunity to fight his removal proceeding. The announcement concerning the motion of stay was made at a press conference and rally outside the Jacob Javits Federal Building in downtown Manhattan. Supporters also announced a public petition to demand that ICE release Villavicencio from detention now.